The field of hydrogeology is one of the largest employers of geologists. The fact that many geology graduates find employment in this field with a bachelor's degree emphasizes the importance of teaching hydrogeology well at the undergraduate level. Below, you will find a variety of resources for educators who teach undergraduate hydrogeology. We have provided links to a growing collection of activities and assignments, internet and computer resources, useful articles and presentations on teaching hydrogeology, working groups and a discussion forum, and lots of creative ideas for teaching hydrogeology. 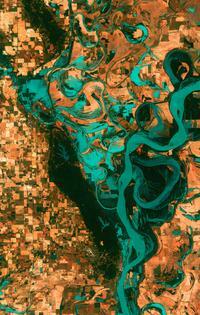 Oxbow lakes and cutoffs on the meandering Mississippi River south of Memphis, Tennessee. 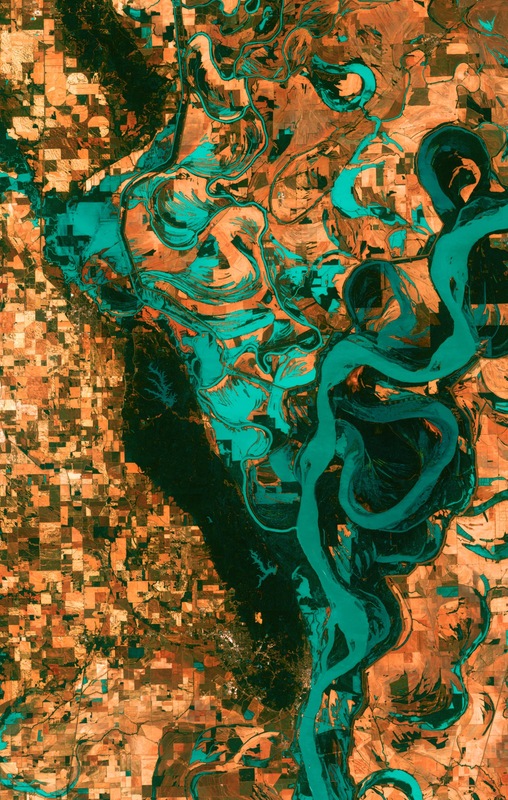 USGS/EROS Landsat 7 image, May 2003. Explore example learning goals for Hydrogeology from your colleagues. Learn more about setting effective course goals from the Course Design Tutorial. 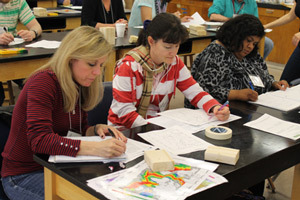 Browse course descriptions and syllabi to understand the range of petrology courses currently offered. Hydrogeology courses help students build a variety of skills and critical thinking abilities. In addition to those listed below, a selection of applicable pedagogies can be found in the Teaching Methods area. Teaching Hydrogeology in the Field: A number of workshop presenters and participants have shared their expertise in teaching with and through field work. Here, you can benefit from their experiences and learn from their presentations and teaching activities. You can also find safety resources and links to published guides and databases. Once you've identified the core learning goals for your course, you can use them to focus your search for relevant materials in our resource collections. The materials listed below reflect the contributions of faculty members from across the country. Course descriptions and syllabi including learning goals and supporting information. Also, a 2012 study of published literature and survey results found 15 topics that most hydrogeologists consider essential in an undergraduate hydrogeology course. Teaching activites for class and lab as well as out-of-class activities and projects. Hydrogeology analogies useful for conveying hydrogeology concepts to students. Visualizations that can be useful in teaching about hydrogeology. Selected readings accessible to undergraduate hydrogeology students. Additional resources: Useful websites and resources recommended by faculty who teach about hydrogeology. Ideas for inexpensive but effective hydrogeology demonstrations to use in the lab or classroom. These ideas were generated during the 2005 workshop Teaching Hydrogeology in the 21st Century. Analytical Geochemical Instrument Registry: From the Petrology module, this registry provides faculty with a place to share information about analytical geochemical instruments such as SEM, ICP-MS, x-ray diffraction and more. If you would like to share access to the equipment at your institution, or if you would like to find access to instruments at other institutions, this is a great resource for you. Add your instrument to our database. 2013 Teaching Hydrogeology, Soils, and Low-T Geochemistry in the 21st Century: This workshop will bring together faculty who teach courses in hydrogeology, soils, low-T geochemistry, biogeochemistry, and upper level environmental geoscience to address questions of how to teach these disciplines most effectively at the undergraduate level. 2005 Teaching Hydrogeology in the 21st Century workshop: During the summer of 2005, 70 hydrogeologists from around the country met for a week-long workshop to explore best practices in teaching hydrogeology. Download handouts and supporting materials from workshop presentations and discussions or view the workshop program. Contribute materials such as course descriptions, teaching activities, visualizations, and references to help build our resource collections. Working groups in key areas of hydrogeology were established at the summer 2005 workshop. Working groups were tasked with collecting and developing new materials for teaching hydrogeology. If you would like to join a working group, please contact Barbara Tewksbury at Hamilton College (btewksbu@hamilton.edu). Join our Hydrogeology email list to take part in discussions with colleagues who teach hydrogeology and to read past discussions.